A smart formal cane suitable as an accessory to formal outfits. 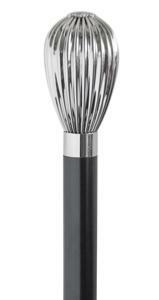 The chrome plated handle is formed in a generous balloon shape and is suitable for larger hands. The shaft is beech wood painted black and fitted with a discreet rubber ferrule. Overall height 92cm. Ferrule diameter 19mm. Item weight 285g. Not suitable as a mobility aid.